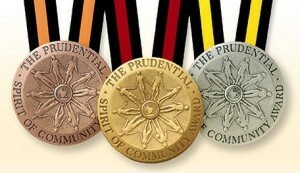 Charles County Public Schools (CCPS) students can apply for the 2016 Prudential Spirit of Community Awards program, which honors middle and high school student volunteers. The annual program recognizes students for exemplary acts of volunteer service in their communities. The awards are given to students for serving their communities through volunteer activities, such as helping the less fortunate, promoting health and safety or protecting the environment. Students in grades five through 12 are eligible to apply and must have participated in a volunteer activity that occurred in the past 12 months.